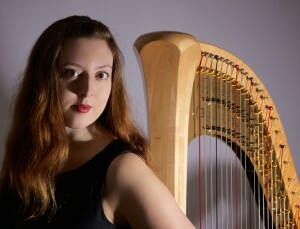 Angelina Warburton is a professional Harpist based in Manchester. She is available to provide background music for weddings and other social events. Her extremely varied harp repertoire includes popular classics, modern pop arrangements, and much-loved melodies from musical theatre. She completed sixth-form at Chetham’s School of Music in 2007 and graduated from the Royal Northern College of Music in 2011, under the tutelage of Eira Lynn Jones, (Internationally acclaimed Harpist). Angelina spends the majority of her time playing her harp in orchestras and ensembles around Manchester, Liverpool and elsewhere in the North of England. As a professional harpist she has worked with famous singers including Katherine Jenkins and Idina Menzel. She has also played harp with the National Symphony Orchestra, the National Festival Orchestra, and the British Philharmonic Concert Orchestra.